Texans Can Academy – Garland is preparing for dual credit courses in conjunction with Richland College, one of the seven independently accredited colleges of the Dallas County Community College District. The courses began October 29, 2018. Students are taking the opportunity to earn high school and college credit in a series of Career and Technology courses such as Business English, Introduction to Keyboarding, Microsoft Office and others. “This is a new program for Texans Can Academy – Garland, but we look forward to this journey of ensuring our scholars have a pathway to college and career readiness,” says Texans Can Academy – Garland Principal Dr. Daniel Johnson. Richland College recently hosted a college orientation to help students with completing college enrollment forms. 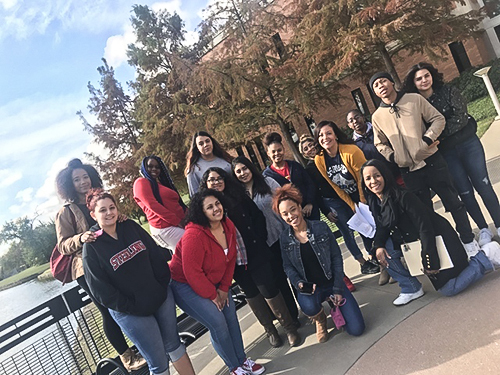 During the orientation, 41 Texans Can Academy – Garland students received college ID cards, toured the campus and participated in a community building activity. Most importantly, they got to envision their futures after high school graduation from high school. By expanding their college and career-readiness courses offered to students, Texans Can Academies are expanding life opportunities for non-traditional students.